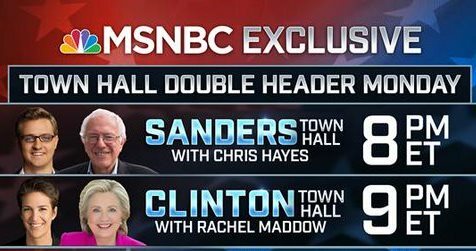 MSNBC will host back-to-back prime time town halls with Democratic presidential candidates Hillary Clinton and Bernie Sanders this coming Monday, April 25. The two candidates will face questions from voters at the National Constitution Center in Philadelphia on the eve of the make-or-break mid-Atlantic primaries. At 8 p.m. ET, Chris Hayes moderates an hour-long town hall with Sen. Sanders as he competes in the must-win state of Pennsylvania. At 9 p.m. ET, Rachel Maddow moderates an hour-long town hall with former Secretary of State Clinton as she fights to secure the party nomination. MSNBC has hosted 14 previous town halls with Republican and Democratic presidential candidates this campaign season as well as a series of long-form interviews with candidates on both sides of the aisle.